Leader of the TNA and the official Opposition said at a recent counter terrorism conference in India that as many as 150,000 Tamils had been killed by the armed forces. While the figures vary from person to person or from NGO to NGO as to the civilians killed during the Sri Lanka’s war against the LTTE, Sampanthan’s figure of 150,000 killed is at the high end of such a fictitious array of figures. However, as the leader representing the country’s official opposition, Sampanthan is expected to express his views responsibly in keeping with the high standards expected of his office. Hence, the government of Sri Lanka should take very urgent action to seek clarification from Sampanthan, and follow up with legal action for spreading false information about the Sri Lankan armed forces and its members at an international conference. If Sampanthan cannot defend his position, urgent action should be taken to have the law on him. 1 Why did Sampanthan make this statement at a conference in India? 2 Can Sampanthan justify his statement with facts and figures? 3 What are the sources for his statement? 4 What evidence can he cite to prove the figures publicised in his talk? 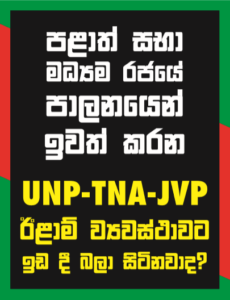 5 As the official Leader of the Opposition, did he not know that he was jeopardizing the national security of Sri Lanka? 6 Is he willing to defend his position in a court of law? It has to be remembered that Sampanthan and his political party never criticised the violence perpetrated by the LTTE Tamil terrorists when they were active from the late 80s to 2009. Since the end of the conflict, they have never cited a single incident of HR violations committed by the LTTE, including killing of Tamil civilians and use of Tamil child soldiers for armed combat. Further, Sampanthan and his party is actively involved with various LTTE fronts and partisan NGOs in vilifying the Sri Lankan armed forces and insisting on investigating ONLY one side for alleged war crimes. Hence, Samapanathan should face an investigation on account of his vilification of the armed forces, as the Leader of the Opposition of Sri Lanka.